I took my three girls to the dentist a few months ago, and we got a good bill of dental health and also had reports of very little to no plaque. We were told, “Don’t change a thing.” This is a big deal in our family because my oldest daughter had cavities requiring sedation and extraction of a molar when she was about 6 years old, as well as a couple of other trouble spots that were being watched. Dentist appointments always made me feel like a terrible parent back then, but I am very excited to see the fruits of our hard work paying off at the dentist nowadays. For us, I think it really is more than just sugary substances. I now think of any grain like a sugar, and teach my children the same. I teach them to try to get their nutrients from vegetables, fruits, and meats rather than insulin-spiking grains with phytic acid that can have detrimental dental effects. I endeavor to teach my children that grains are a treat, a real treat. On a personal level, since eating GAPS, I never wake up with that icky, yucky tooth scum I used to get. 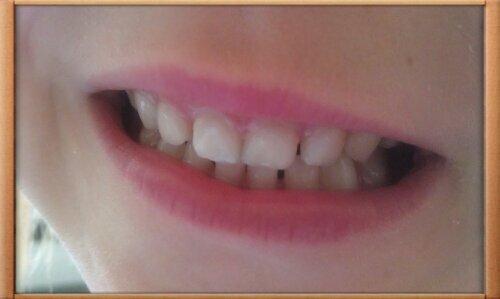 Strangely, when I started GAPS, I noticed a light pinky-orange tint to my teeth. Very strange. It went away on its own. I don’t know if it was a food I was leaning on, like carrots, or a change in bacterial by-products or what. It’s gone, and I’m due now for my dental check-up. Can’t wait to see how it goes! I implore you to look at the food you are eating and feeding your families. Make some changes, and I’ll bet you find some perks you just aren’t expecting! This entry was posted in GAPS and tagged GAPS, gum recession, my kid has cavities, paleo, SCD, teeth, whole foods on August 9, 2013 by thehomeschoolingdoctor.